Boley 8mm watchmakers Lathe with 8mm Whitcomb collets. there is also an 8mm to M12x1mm collet adaptor for a chuck. We have limited knowledge with this type of item. UK up to a total sale value of £60 is £4.95 (1. ). 6mm Chuck for Watchmakers Lathe. Shaft 6mm ~ Internal chuck bore 14mm. For Sale is a set of Watchmaker's Lathe Dog Carriers. These are mainly nickel plated lathe carriers. I have a 100% record for a good reason. Watchmakers Lathe Hand Wheel . Condition is Used. Dispatched with Royal Mail 2nd Class. WATCHMAKER´S LATHE - TORNO DE RELOJERO. USED - USADO. RUPASOL cuenta con años de experiencia en la venta de relojes y artículos de colección. - Envíos internacionales. - Envíos nacionales (España). Enviamos artículos a todo el mundo. 1/4" bore suitable for use on watchmakers lathe etc. Gravers not supplied with this item. 1/4" bore suitable for use on watchmakers lathe etc. Gravers not supplied with this item. Excludes clearance lines. One 6mm shank stainless steel arbor (with stainless steel washers and stainless steel nut) to suit 2" Diamond wheels with 1/4" (6.35mm) bore. HAS A JT0 TAPER. WATCHMAKERS SMALL DRILL CHUCK. OR SEE OUR OTHER 4100 ENGINEERING TOOLS. SOFT END ARBOUR. MTO LATHE CHUCK ADAPTOR. END IS SOFT TO ALLOW MACHINING. OR SEE OUR OTHER 3700 OTHER ENGINEERING TOOLS. 0MT WATCHMAKERS ARBOR. THREADED 12 X 1MM. The wheel is turning freely with hand. ( no rubber or motor ). it does need good clean and service. 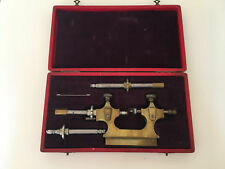 PULTRA 10 WATCHMAKERS 8mm LATHE IN BOX FLIP OVER TOOL REST & COLLETS.